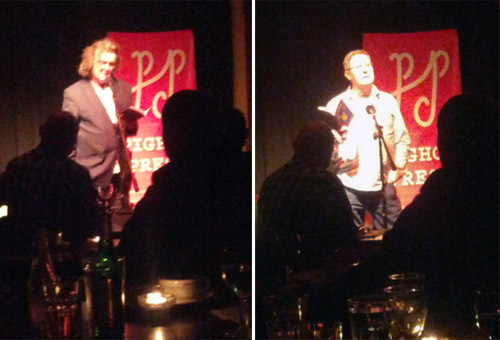 Had a lovely evening last night at the Redroaster in Brighton, at Pighog’s last event of the season. As well as the winners of the Moss Rich competition, we had sets from Brendan Cleary and Robert Hamberger both of which I really enjoyed, and an eventful open mic, more about which later. Brendan (who I’d not seen perform before) lived up to the image of the ‘Irish poet’, reading poems mostly about booze, pubs and women… very funny and great delivery. 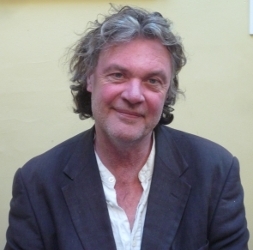 Having said that, also included a number of very moving unpublished poems about his late brother. I had a slight moment of panic when Robert Hamberger turned to me in the queue for the drinks. “Hello! I’ve seen your blog!” he said and I suddenly recalled the video blog I did a few weeks back, when I read a poem of his. “Oh… you … saw me reading your poem…” Thankfully, he didn’t seem to mind, and said he enjoyed hearing someone else read it. Actually I can’t remember if he said it was interesting or whether he liked it .. he might just have been being polite! On my table I got talking to a lovely couple from Burwash one of whom turned out to be Richard Ormrod, the second prize winner in the Moss Rich competition. I told them about our forthcoming Brighton Stanza event at the Redroaster (ooh, I must blog officially about that soon) and they in turn told me about open mic events at the Troubadour in London. I do get all the emails about the Troubadour, but I’ve never summoned up the courage to go and read there. Maybe that’s one of my goals for 2013. The evening drew to a close with drama at the open mic – I’m always moaning about open mics being too hurried, but in fact this was one where I wish the readers had been limited to one poem. A couple of people rather took the (open) micky a bit by going on at length. Plus, the last reader only managed about 3 lines of his poem due to the fact that he’d ‘been to the pub’ and couldn’t read what he’d written. Several LONG minutes later and after he’d called upon a member of the audience to ‘help’ him, a few more aborted goes at reading the sodding thing, some grappling and grabbing of the mic, a bit of F-ing and blinding, he left the stage peacefully and we all breathed freely again. That’s poets for you! 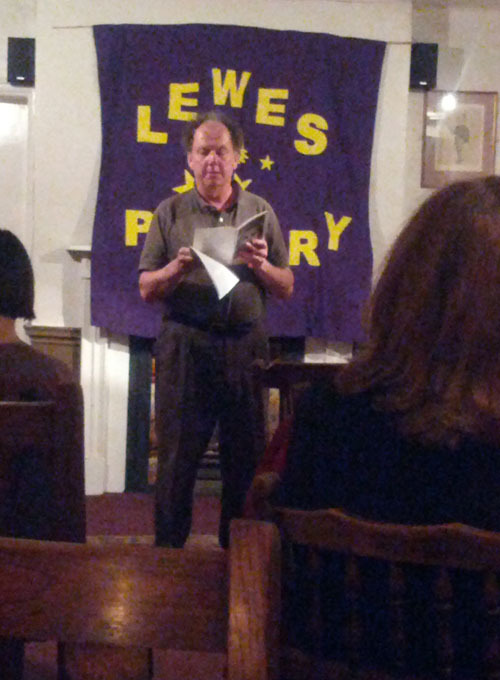 One of my aims is to start attending more poetry readings. Not sure about open-mics though….cringing as I was reading your account! Ha ha! Actually that wasn’t typical of the readings I’ve been too, even the more ‘lubricated’ ones, and if there’s an MC who’s used to handling that sort of thing, generally it’s not a problem. Having said that I hope our Brighton Stanza event in January doesn’t attract any trouble… we shall see!